Nordic Yulefest - an enchanted world of Scandi food and cocktails, plus games, a photobooth and more - comes to Old Street for Christmas 2016, with a totally immersive experience. Tickets start at £8 for entry, rising to £35 with food, drinks and gaming tokens, rising to £85 for whatever the Nordic for 'full monty' is, including a 5 course dinner. It all sounds incredible! 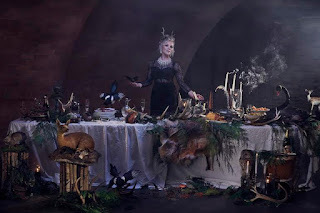 "This December an Enchanted Nordic Yulefest is popping-up in the heart of Shoreditch. Curated by pop-up extraordinaire and brand imaginer Meredith O’Shaughnessy, the month long extravaganza of Nordic themed festivities will be a Christmas experience like no other for Londoners this December. Revelers are invited into a Christmas cavern of candlelight with evergreen crowned sprites, sheepskin-laden nooks and an abundance of Scandi delights, with the charismatic Tomte (Santa Claus to you and me) who will be leading the merriment into the early hours. available from the 1st to the18th December 2016 with varying ticket options available starting at £8. As guests are guided into the candlelit misty archways by spritely hosts you enter a world bedecked with antlers and taxidermy. DJ’s and entertainers will be crowned with evergreen headdresses and you will be invited to join in with the Dance of enchantment and candlelight as we countdown together to Christmas. This year brings a new twist to the Scandi-spectacular with norse entertainment and northern frolics…try your hand at an impish game of Wheel of Fortune or enter the chamber of bravery, where you can attempt to eat Swedish delicacy Surströmming (rotting herring). A grizzly bear lurks in the photo booth and antlered beasts invite you to indulge in drinking games. Meredith O'Shaughnessy is the award winning imaginer who has created some of London’s most fun and fabulous experiential brand experiences including AVOPOPUP, Keeping up with the Joneses, Broken Hearts and Promises, Nordic Yulefest and many more."